Expert speaker Theodore R. Bromund from The Heritage Foundation discussed changes and continuities in U.S. economic policy under the administration of President Trump. A few hours before he gave a joint interview for the Austria Presse Agentur and the newspaper Kurier. A visit to the summer residence of Maria Theresia: Ambassador Trevor Traina, accompanied by Managing Director Mag. Klaus Panholzer, got a “Highlights-Tour” at Schloß Schönbrunn . 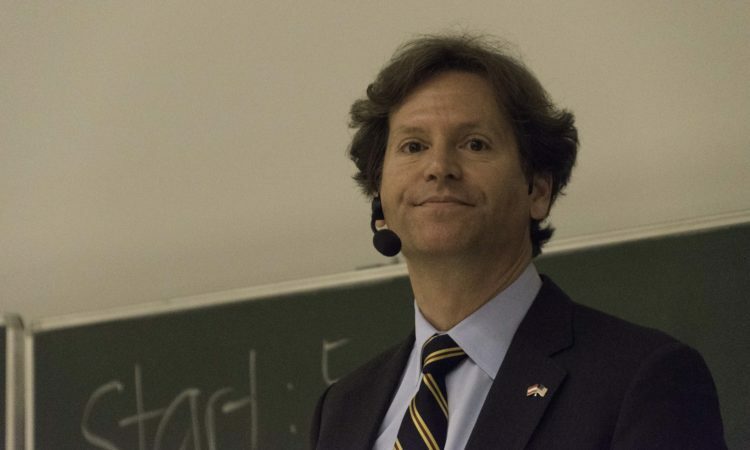 Expert speaker Kevin Lobdell, Director of Alumni Engagement at the College of Engineering and Applied Science, University of Colorado Boulder, delivered a talk about “Science Fundraising: The Role of Alumni” at Amerika Haus on October 23. In his remarks, Lobdell underlined the importance of early relationship-building, in particular, when cultivating future donors. 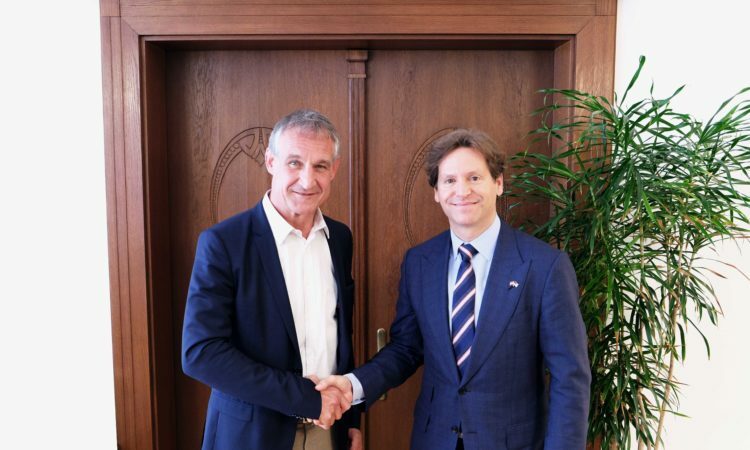 Ambassador Trevor Traina visited the Ban Ki-moon Centre for Global Citizens and discussed with the Centre’s Co-chairman and former President of Austria Dr. Heinz Fischer ways to further develop the diplomatic relationship between the United States and Austria. 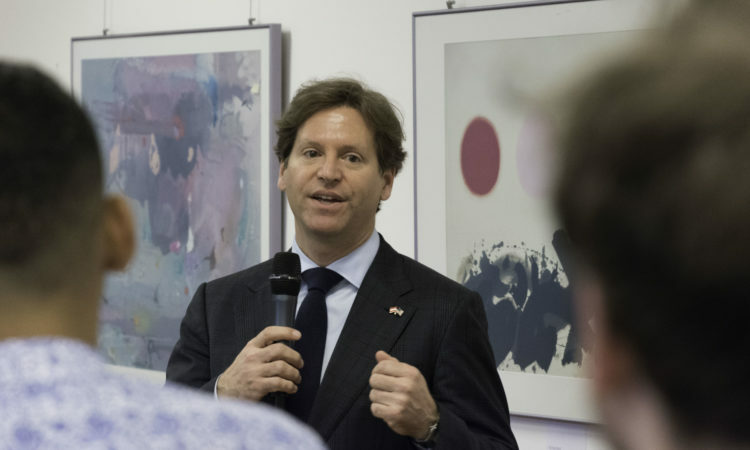 Over a thousand guests celebrated the 242nd birthday of the United States of America at Ambassador Trevor Traina’s first Independence Day reception at his residence in Vienna. On May 24, 2018, Ambassador Trevor Traina presented his credentials to President Alexander van der Bellen at the Hofburg Vienna. Why Does Ukraine Matter to the U.S. – and What Is at Stake for Europe? Civic Action & Policy Making in the U.S.
Chargé d’Affaires Eugene Young welcomed a delegation from the American Jewish Committee to discuss the importance of the transatlantic relationship and combatting anti-Semitism globally. Is America Leading, Following or Getting of the Way? On September 28, Chargé d’Affaires Eugene Young congratulated Sandra Kolleth on her appointment as the new President of the American Chamber of Commerce in Austria at a Welcome Dinner. Ms. Kolleth is the first woman to hold this position. On September 27, Chargé d’Affaires Eugene Young met with Vienna’s Mayor and Governor Michael Häupl at Vienna’s City Hall and thanked him for the good cooperation between the City of Vienna and the U.S. Embassy. On September 25, Chargé d’Affaires Eugene Young met Austrian Federal President Alexander van der Bellen at the Hofburg. They discussed a series of bilateral and global topics and emphasized the ongoing strong relationship between the United States and Austria. The Special Olympics USA Team enjoyed Austrian hospitality during the Special Olympics World Winter Games in Styria in March 2017. And in return, they donated ski goggles and helmets to the Austrian Paralympic Committee. On September 22, Chargé d’Affaires Eugene Young handed over this equipment. On September 21, Deputy Chief of Mission Eugene Young gave welcome remarks at a craft beer tasting for 100 selected guests, co-hosted by Austria’s biggest craft beer store BeerLovers and the U.S. Brewers Association. 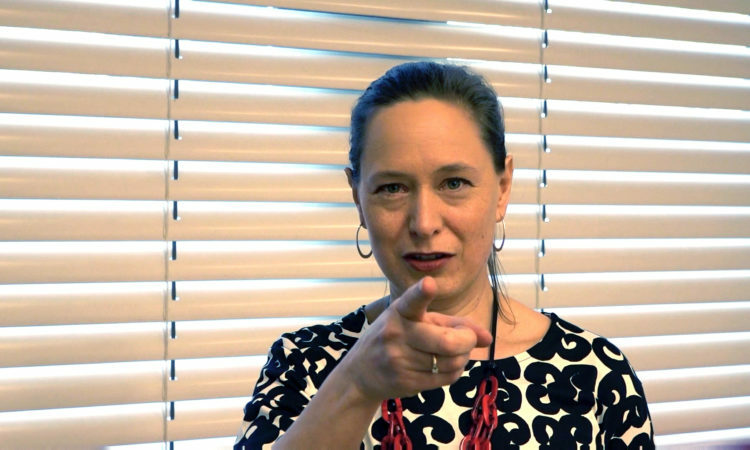 The event promoted U.S. craft beer in Austria and introduced Sylvia Kopp, the American Craft Beer Ambassador for the Brewers Association. Amerika Haus, June 15, 2016 On June 15 a Consular workshop took place dealing with death cases, featuring speakers from an Austrian funeral home, a Caritas Hospice grief counselor and a top forensic pathologist. 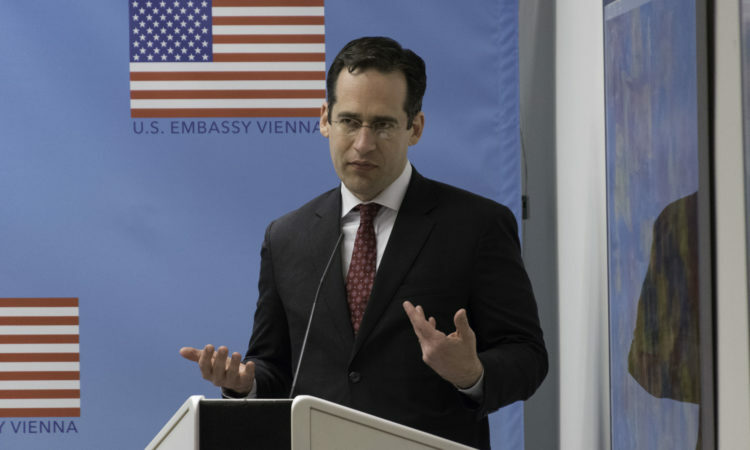 The U.S. Embassy in Vienna was represented by Consular Section staff and a representative of the Federal Bureau of Investigation. Tom Plant from the Center for the New Energy Economy talked about energy efficiency and the role individual states play in developing an energy policy. One of the goals he discussed was the shift from coal-powered electric plants to natural gas and renewable energy. He explained the various stages of the Clean Power Plan Timeline and answered questions from the audience. The U.S. Embassy together with the Fulbright Commission hosted a concert featuring the duo Ogni Suono , consisting of American saxophone player and Fulbright Scholar Phil Pierick and his partner Noa Even. The duo presented contemporary American and international compositions. Fulbright Austria Executive Director Lonnie Johnson introduced the program and highlighted the value of educational exchange. The U.S. Embassy organized a workshop for music students and a concert with the Austrian-American Doug Johnson Jazz Trio, consisting of the pianist and associate professor at the Berklee College of Music Doug Johnson, the New York bassist Edward Perez and the Austrian drummer Harald Tanschek. Mark Kennedy from the George Washington University addressed the Transatlantic Trade and Investment Partnership (TTIP) and the 2016 U.S. presidential elections. He had served as a member of the United States House of Representatives from 2001 to 2007. Women’s Leadership in the new Global Era: Today’s Voices was privileged to host a roundtable discussion with author, speaker, and consultant Sally Helgesen . Council members had the opportunity to meet Ms. Helgesen and discuss important topics such as “fast forwarding the female advantage,” diversity and inclusion in the workplace, and tapping into the female vision.